I am 72 years old, and I am on the praise team of Cornerstone Christian Church. The illustrator for the book, Jamie Cosley, is the worship leader. Jamie had already done the artwork, and asked me if I could write the text in verse. Since I like writing songs, I gave it a try, and this is the result. Baby Boy, Little King, written for young children, is a delightful rendition of the Christmas story. Written by Jim Hargrove and illustrated by Jamie Cosley, Baby Boy, Little King details the first Christmas in an enchanting way. By the author using rhyming text, young children will want to hear the story over and over again. Soon, they will be chanting the story along with the parents, as it is easy to remember and fun to repeat. The lovely illustrations will also enchant young children and their parents. The inclusion of animals, shepherds and the three kings demonstrates how all people are affected by this baby boy. Artist Jamie Cosley also uses such items as patches on the Holy Family’s clothing and the gift of a loaf of bread from a young boy to demonstrate how the baby touches the impoverished. Likewise, Jamie Cosley shows the riches of the three kings. The joy of all is beautifully depicted, and the author highlights how this joy remains in current times with the last two lines of the book: "And we can do the same as they, And worship Him this very day." In this unique presentation of the Christmas story, the use of rhyming poetry will certainly captivate the imagination of young readers. Author Jim Hargrove, and illustrator Jamie Cosley have skillfully developed an engaging children’s version in Baby Boy, Little King. The poetry and the drawings create an exciting and joyful atmosphere. Every child will be able to visualize the scene and feel a part of the unfolding drama. This is a beautiful book! 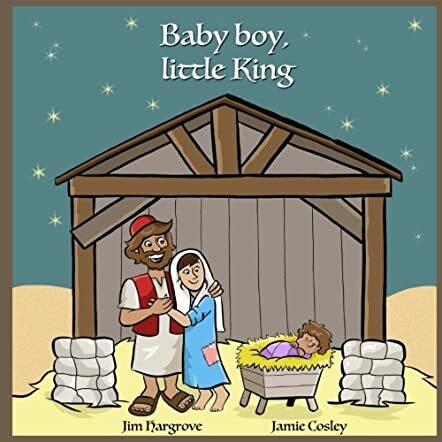 Baby Boy, Little King is a religious-themed picture book for children written by Jim Hargrove and illustrated by Jamie Cosley. The birth of Jesus Christ in a manger in Bethlehem is often overlooked in the festivities of the Christmas season, even if He is the reason for the season. This book celebrates that birth and shares with children the jubilation and joy felt by all those who came in contact with the blessed child, from the shepherds and townsfolk to the Wise Men who traveled from afar on their camels while following the announcement shared in the stars themselves. For kids who are wondering what they can bring to the Baby Boy, there’s no need for precious gifts like frankincense or myrrh. Simply by giving him their “humble hearts” can they bring a smile to that little boy’s face, a song to His heart, joy and laughter lighting up His face. Giving Him their love is all the recompense needed. Like the Wise Kings of old, everyone can worship that Little King on His birthday and every day. Jim Hargrove’s religious-themed picture book for children, Baby Boy, Little King, is a joyous and jubilant work that begs to be read aloud, and I suspect everyone who gets this book for their kids will be reading it aloud again and again, no matter what the season. I’ve rarely read a Christmas-themed book that celebrates the birth of Christ as eloquently and enthusiastically. Each panel shows worshipers from miles around with their eyes lit up in delight and smiles adorning every face. The prose is upbeat and simple, making this book suitable for young readers to read on their own as well. Jamie Cosley’s illustrations are marvelous and perfectly suited for this celebratory book. Each panel is boldly and brightly colored, and they fit the tenor and mood of the story to a T. Baby Boy, Little King is most highly recommended. The wonderful news of the birth of our Saviour is something that has been shared over and over again. There are so many ways to express the joy and awe that have surrounded the birth of this one special child, and these words of jubilation have been shared countless times over the centuries. It is a simple story. A child is born, the Son of God. Angels sing in praise, shepherds look on in wonder, and kings travel from far away to witness this glorious birth. What child would not be attracted to such a story? In fact, it attracts all children, young and older. Jim Hargrove is a master at telling a story in rhyming verse. His little picture book story, Baby Boy, Little King, is a retelling of Jesus’ birth, told in part song, part verse. His rhythmic wording will attract the young reader, as the story is shared yet again to another generation of believers. By telling the story in a simple rhyming verse, the author has made the story into his own song of praise celebrating the event that, over two thousand years ago, changed the world forever. “He’s just a child, but so much more./ A special gift we have in store./ The gift of love, and life, and joy./ It all comes from this baby boy.” Simple words with a powerful message. Along with clear, distinct illustrations by Jamie Cosley, this is a good book to introduce young readers to the story of the very first Christmas.